I have been a declutter machine this week! I've had the whole week off, so what better to do than get rid of stuff before we get more stuff at Christmas!? My photos are clutter-free on both computers (the desktop and the laptop). I deleted tons of duplicates! Everything is nice and organized into folders now, just the way I like it. The biggest project was my son's closet, which I don't think has been cleaned out in years. I bagged up so many toys and stuffed animals. I even found a new, still-in-the-box water gun that his friend gave him for his birthday last year. 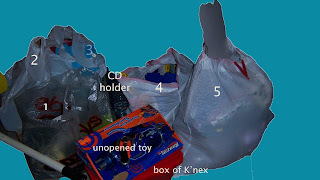 Here's a picture of the CD holder (it wouldn't fit in a bag), k'nex, unopened toy, and 5 bags. I also decluttered clothes from his closet as well as mine and my daughters. 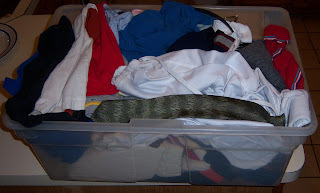 This is a jumbo-sized container, and I found even more clothes after this photo was taken. I'll be making a trip to the donation site this weekend. Right now I'm off to declutter the bookshelf and file cabinet. P. S. Have you visited Organsing Queen? What are you waiting for?! Thanks for the motivation!! I need to organize! So when are you decluttering my house? ;) You rock! I'm sure you are back to work this week!